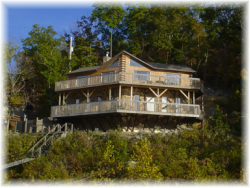 The Pelican Point is a 3 bedroom, 2 bath Lake of the Ozarks Vacation Rental that was built with native cedar log and has 2 levels of full length decking. These decks carry tables/seating for 10 minimum along with hammocks and a gas grill. Although the Lake of the Ozarks boasts many great sunset locations, not many will compare when you add the quiet that will surround you here on the Little Niangua Arm. Main Level- This is where you will enter the beautiful modern log home and where you find the living room, kitchen, dining, bedroom with king size bed and one full bath. The gas grill is just outside the dining area exterior door. Warehoused in the kitchen are all the cooking and eating utensils you'll need during your relaxing stay. Just bring food and drink! Lower Level- Explore here for the other two bedrooms, both with queen size beds. Also on this level there is a living room with TV, VCR, DVD and a pull out queen size sofa sleeper, so the home sleeps 8. All the bedrooms in the house have lake views, closets and night stands - the two lower level bedrooms each have a dresser. The second full size bath and laundry room with large capacity washer/dryer found their way to this level also. This home is perfect for your stay in a Lake of the Ozarks Vacation Rental! For stays during the cooler months there is a wood burning fireplace in the living room on the main level. On the water side, a private covered boat dock with a slip that measures 10 X 26 and also has a swim platform and ladder. The owners hope you enjoy your stay!! There are also many great activities to enjoy on the Little Niangua Arm of the lake such as fishing, boating and canoeing. These homes are ideal for family getaways and just enjoying time with family. 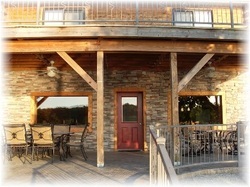 The Sunset View is a 4 bedroom, 2 bath Lake of the Ozarks Vacation Rental that was built with native cedar log and has a custom stamped concrete patio on the lower level and a large upper deck. The patio offers tables/seating for 10 minimum along with a hammock and a gas grill perfect for dining and entertaining. This area has 2 ceiling fans with lights and mounts for the hammock. The uncovered area of the patio is ideal for sunning during the day and relaxing around the fire pit at night. We don’t call this home the Sunset View for nothing - although the Lake of the Ozarks boasts many great sunset locations, not many will compare when you add the quiet that will surround you here on the Little Niangua Arm. Main Level - This is where you will enter the beautiful modern log home and where you find all four bedrooms. The Sunset View offers two bedrooms with king size beds, TV’s and waterfront views the home also offers two bedrooms with queen size beds. This floor also has a full bathroom as well and control for the central heat and air. Lower Level- Explore here for the living room, kitchen, dining room, laundry room and second bathroom. The full kitchen is equipped with a large capacity refrigerator, microwave, dishwasher, electric range and common small appliances. Also warehoused in the kitchen are all the cooking and eating utensils you'll need during your relaxing stay. Just bring food and drink! There is ample storage space in the cabinets for food and supplies. The lake view dining table seats 8 comfortably. The living room offers comfortable seating with a wood burning fireplace, flat screen TV, VCR, DVD and a pull out queen size sofa sleeper, so the home sleeps 10. On the water side, a private covered boat dock with a slip that measures 10 X 28 and also has a swim platform and ladder. The owners hope you enjoy your stay!! This home is also perfect for your stay in a Lake of the Ozarks Vacation Rental! No matter which home you choose to stay in, you will have all of the comforts of home but with the added bonus of lake views and your own private covered boat dock. Also, Lake of the Ozark boasts some of the greatest fishing in Missouri, so if you like to Fish this is the place to be!